We all know the economy needs jobs. Not industrial economy jobs, which we’re transitioning away from, but knowledge economy jobs. But where did the Apples, Microsofts and HPs that fuel today’s economy come from? That’s right, startups. Our entry Gazelles + Economic Gardening = Prosperity highlighted this very trend back in 2003. In 2007, we posted how every neighborhood needs a coworking space. Today we’re in a jobs crisis. The time is right to converge these two trends. “Delusion is the hidden startup killer. It leads to self destructive decisions in every aspect of the business. And delusion thrives in isolation. Teams in isolation tend to imagine market demand that’s not there. When they do, there’s no one to question them. For solopreneurs, it’s even worse, because they don’t have teammates nor enough customers to keep them anchored to reality. Coworking can be great for solopreneurs because they are surrounded by a diverse group of people who can keep them from getting delusional. But coworking doesn’t fit startups, even with only 3-5 people. Coworking starts to get less affordable when you’re renting more than one desk, and it starts to feel distracting to your team. But these are minor issues. The real problem is the cultural gap between freelancers and startups. Freelancers value their independence above all else. They want to stay small and don’t want to be chained to any one project. They would rather dabble in at least a few at any given time. Startups are the opposite. They demand focus, sometimes single-mindedly. And they don’t want to stay small, they want to grow. Fast. I don’t typically recommend that startups hire freelancers because startups need continuity in their team and 110% commitment. I also don’t recommend that freelancers work for startups, because they might start to feel trapped — like they are finding themselves in the job they just tried to escape. 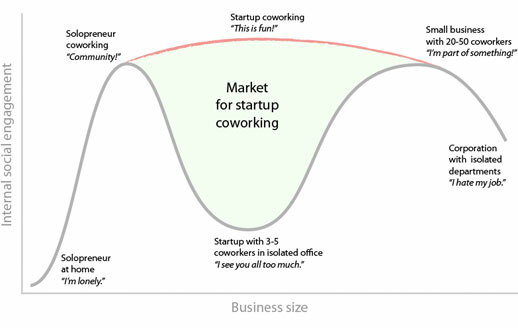 Second, we present a graph that illustrates the need and opportunity for startup coworking spaces, a much more contemporary version of business accelerators, and more focused on creatives. Because they’re geared toward more creative, innovative startups, these typically aren’t government or university run. They can certainly be assisted by either though, as long as the somewhat irreverent startup vibe stays true. If you know of one, or would like to start one up, please comment below. One previous entry you may want to look at: the entrepreneurial development system modeled after the A, AA, AAA levels of professional baseball. If there’s one job creation lesson to be learned here, it’s this: The graph shows there may by a purely psychological reason why solopreneurs don’t want to be startups… unless there was a more socially engaging environment to be in. Your chart has so much insight embedded in it. You could write an insightful blog post on just about every inflection point along the curve – why it’s there, and the opportunity it creates for entrepreneurs and developers. This is an interesting hypothesis, thanks for sharing. I think that TechStars did a great job of this when they opened up the Boulder facility recently for the Winter in the Bunker program. They’re already focused on startups and they have the facility and experience to help startups thrive. You NAILED it. There is nothing theoretical to this, being a ‘solopreneur’ stinks. And so do fancy startup offices run and administered by delusional bureaucrats. An entrepreneuer is a certain type of animal – and it actually likes to be in herds (it doesn’t need fancy office space). The lucky ones can bang their heads with likeminded peers. The rest take the bumpier roads to success. Great post Neil. The opportunity is certainly out there to create a coworking space geared more towards start-ups but I love the interplay and collaboration that happens between freelancers and start-ups at Affinity Lab. Co-working can be a fun way of sharing resources, building contacts, and helping ideas grow. It”s about working on your own terms and taking a break for a quick chat, asking for advice and learning from others. Co-working is meeting other people that think like you. Co-working is great as we here at TheCube can proof. Your hypothesis is correct as long as you assume globalism and the off shoring of good paying jobs is inevitable. It is not. Our current economy is the result of our Federal government’s immense market-making capabilities via public policy and direct investment, which has largely benefited our country’s upper one percent income bracket over the past 30 years (this is not just my opinion but that of folks much smarter than me such as Elizabeth Warren). Yes, your concepts are useful for those who are trying to leverage what’s left of our supposed “free market,” but, really, this is just one U.S. region poaching from another at this point. Zigy, I appreciate your comments, but please provide a link to more research or evidence clarifying your statements. I’m not sure we’re talking about the same things here. The point is, countless numbers of people with bosses want to be their own, but they don’t feel supported enough to do so, and don’t. That’s bad for job creation. This is about making it easier for them. One author I highly recommend is Dan Pink’s A Whole New Mind, which makes the case for accommodating an evolution to a right-brained creative economy, and that requires a Free Agent Nation, a prior book of his as well. His latest book, Drive, details how to motivate such modern creatives. It has become accepted wisdom that places can only prosper by attracting creative class knowledge workers. This is indeed important, and it motivates savvy communities to address quality of life amenities that appeal to those with talent and the financial means to pick and chose where they live. Highlighting strategies that allow people to live more efficiently in a more environmentally sustainable manner, as you have done, is extremely valuable. Knowledge workers, though, constitute only about 1/3 of our workforce. The current economic crisis has brought into sharp relief that plight of the other 2/3 of our workers who have been negatively affected by the impacts of globalism. For the past 30 years, the middle class has been getting squeezed and it appears we are finally paying the price for killing the consumer economy that has propped up our economy all these years. The bottom line is that promoting strategies that create “Cool Towns” with market appeal to knowledge workers is not a bad thing. But the havoc reeked by the current economic crisis has created a new awareness of and appreciation for the value of good paying jobs that were not dependent on the placemaking strategies you advance. All things being equal, communities will benefit from cool town strategies. They are not for everybody howeverâ€”perhaps for as many as 2/3 of our nation’s workers. There simply are not enough public or private resources to create enough cool towns. For a decent quality of life, people must now look at their Federal government and re-examine the policies that are killing the middle class. In a free market, cool town strategies matter. It’s becoming increasingly clear a truly free market has never existed. As an urban planner, it pains me to say this. Don’t stop what you’re doing. But start thinking about policy instead of placemaking. I understand if you don’t post this. Hey everybody, I was reading the stuffs on here, my company Variety Studios is basically a start up partnership. We do graphic design, web design, branding and a variety of other advertising, visual art related things… photo retouching, all that stuff with out the overhead of a big company. I’m not sure this is exactly the idea which y’all are discussing, but it’s pretty nice to go to class with all different types of businesses that are getting their feet under them (start ups, entrepreneurs, etc). My first studio / work space was at a place called the Gear Factory where I could make art and design, and there was an abundance of creative start ups and individuals around working etc.. Similarly there were shared conference and presentation space at the Gear Factory. I believe there is another incubator program down the street the other way which serves more technical job fields but I am not as familiar with it as much. It is called the Syracuse Technology Garden. Anyway, I was just reading over bits and pieces of the post and comments, and Neil encouraged anyone to post if they knew of anything like it so there it is.